Columbus Cottage is a delightful, magical hideaway set in a mature garden with expansive lawns and exotic trees only minutes from Omaha beach and the bustling Matakana markets. The Cottage is well positioned in the 3 acre garden of 144 on Jones. It is beautifully furnished with sumptuous king bed, ensuite bathroom and well equiped kitchen. 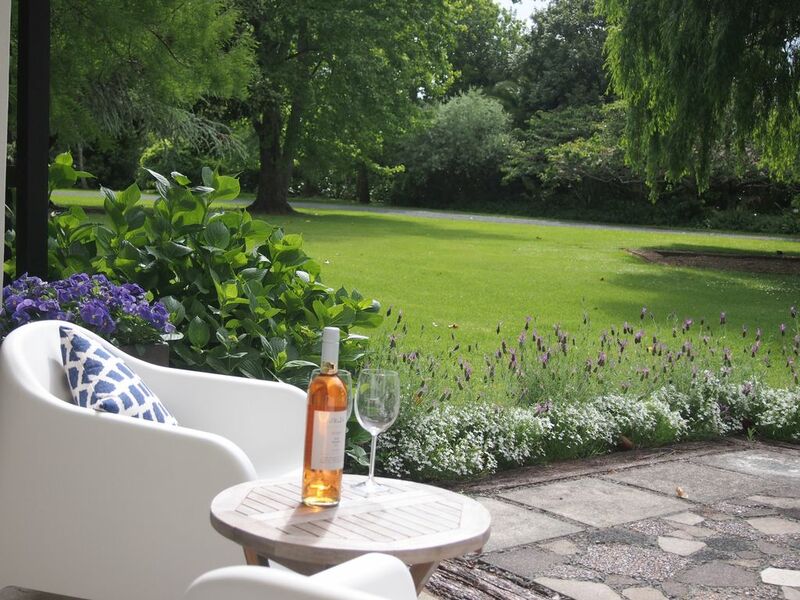 The french doors open onto a sunny terrace leading onto the lawns where you can partake in croquet or petanque or simply meander, in natural tranquility, through the established garden. There is abundant birdlife and as you relax on the terrace with a glass of your favourite, the evening chorus is something to behold. The Matakana Cycle Trail is metres away, opening up Omaha to Matakana or Point Wells with all the local attractions in between such as Jones Rd Cider, Oob, Sculptureum, Matakana Country Park, Takatu Lodge Vineyard and Morris & James pottery to mention but a few - all on a bike! Columbus Cottage offers complete self-catered privacy or alternatively breakfast of your choice available on request. This is either a great place to hide away for a quiet few days or use as a base to explore the local area, which is fast becoming one of New Zealand's more interesting and generally entertaining places to be. Julia was brought up in Norfolk in the UK where she trained as a chef and worked in the French Alps and Turkey before meeting her husband Tony (a good South Island boy!) We lived in Hampshire for 10 years and had 3 children, but felt it was time to head back to NZ for schooling and a better all round lifestyle. Tony works in the IT business. With the children having left home and doing their own thing, the time was right to make the move out of the big City to a new life in the country. 144 on Jones is everything we had dreamed of - an established character property with mature trees and gardens - it was obviously meant to be. Having been brought up in a B & B, Julia had always hoped to be able to have her own accommodation business and 144 on Jones is such a stunning property, it needs to be shared and for others to enjoy. When we bought the property in March 2018, the gardens were in much need of some TLC, so we have spent these last few months cutting back and cutting out in anticipation of spring when the planting can take place. We hope our visitors will enjoy their stay as much as we do. As you drive into the property you may well say 'Wow' or 'Omg' or 'this is beautiful' - we certainly did we first arrived here. We still have to pinch ourselves that we live here and it is our home. We love that we are on Jones Rd, a dead end, country dirt road with other properties hidden in the trees and neighbouring soft fruit farms and the start of the Matakana cycle track on the doorstep. It's close to Omaha beach to far enough away to feel detached and only 5 mins drive to Matakana. - Perfect! Omaha Beach is 5 minutes drive. This is a long white sandy beach, great for swimming, surfing, paddle boarding etc with views out to Little Barrier Island and beyond. North facing cottage, set in mature gardens with expansive lawns and beautiful trees, abundant birdlife and complete peace and privacy. Our guests have the use of a croquet set and petanque. Bikes are available on request, but one bike is extra large size and only suitable for someone 6ft or over! We had such a relaxing stay at the cottage, it is close to the beach and Matakana shops and restaurants. The cottage is beautiful inside and out and the gardens are spectacular. We will definitely stay again! What a beautiful peaceful spot. Exactly how it is described. Beautiful linen, comfortable bed and couch. Very friendly owners who did not invade our privacy at all. Delux bathroom, great kitchen if you want to self-cater. Would definitely come back here again. Plenty to do and see in the surrounding area. Top spot. Such a relaxing and peaceful stay. Great location and the cottage has everything you need. Hosts were great and easy to contact. Highly recommend! Would love to come back. Visit the Saturday Matakana Farmer's Market where the local cottage industries combine to offer a mouthwatering array of deliciousness. Great golf courses, family friendly beaches, cycle tracks & walking tracks are at your finger tips and there are good surfing beaches at Omaha, Tawharanui and Parkiri. Visit Goat Island Marine Reserve where one can snorkel, dive or view in glass bottom boat. Wine and dine in an extensive selection of restaurants, bars and cafes not to mention the numerous vineyards. Visit Morris and James Pottery, The Sculptureum and Brick Bay Sculpture Park or perhaps a boat trip to Kawau Island or sea fishing from Sandspit is more your thing, Lounging at Omaha beach or paddle boarding in the estuary, but one thing you will enjoy is relaxing with a glass of your favourite listening to the evening chorus of birdsong at Columbus Cottage.